The city of Quincy is re-considering its decision to end curb-side yard-waste pickup later this month. Scott Hardy has more. That revelation came Monday night from Quincy Mayor Kyle Moore, during a meeting of the City Council. Moore said the Administration is studying how to internally handle the collection, and is looking at how much the service would cost the city. He added that more people would have to be hired if the city decides to handle pick ups. Afterwards, Moore said that the idea came to him after last month's town hall meeting. Moore says that more details may be available when the Garbage and Recycling Committee meets December 17th. The Council also gave a first reading to an ordinance that would set the city's tax levy for the next fiscal year. Right now, the city's share of the total property tax levy is set to increase by nearly 14 per cent, or about 38 dollars a year. Fourth Ward Alderman Mike Farha says he plans to amend the ordinance in the next two weeks to either reduce that hike or eliminate it, through budget cuts and using reserve funds. Farha wasn't available after the meeting, and Moore says he hasn't seen details from Farha, but welcomes his input. He also warned about relying on reserves. The levy is set to be approved on the 17th, and must be approved by the end of the year. 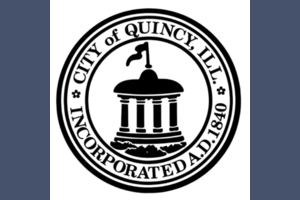 The Quincy City Council has narrowly ratified a three-year contract with its' Central Service and Airport maintenance workers. The Council voted 7 all to approve the contract with the International Association of Machinists and Aerospace Workers Lodge 822, with Mayor Kyle Moore breaking the tie. The contract is similar to other deals approved by the Council with other city departments. That includes a 2% raise the first year, followed by a 2.25% and a 2.75% raise in the other two years. The contract also continues the practice of the city buying back some accumulated vacation time from senior employees. That provision was in the last contract, approved in 2015. The union also represents the city's Animal Control Department, Police Records and Water Department clerks. Union membership approved the deal in July by 5 votes.